Today’s levity was provided by some old guys playing jazz. 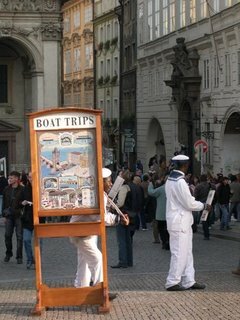 Czech Republic has a very enthusiastic navy for a land-locked country. In the meantime, we have discovered that St. Goliath is in fact the patron saint of Czechs, St. John of Nepomuk who was thrown in the river and drowned by Wenceslas IV (not the good one). The good one, however, does appear several times. But apparently he’s not a king but a duke and not called Wenceslas but Václav. Personally I think there has been a mix up as I don’t know how a Good King Wenceslas could be confused for Bohemian Duke Václav. The duke made Christianity the state religion so it’s up to you to decide whether he was a good man or not. Wenceslas/Václav is depicted on the bridge at least twice and in none of these statues is he shown going out on the Feast of Stephen. Other saints on the bridge include St. Jude of Thaddius, the patron saint of hopeless causes. It’s nice that if your cause is hopeless, you still have a figure to give you... well not hope, obviously, but I guess someone to moan at. Spiritually. There’s even a patron saint of the godforsaken, apparently. Although what good a saint is going to do if God’s given up on you, I don’t know. Saints here seem to be of the shepherd type (carrying a staff or crook) or the TV-repair type (carrying an aerial). This is presumably to reflect the old and new values we attribute to saintlihood. Statues of an angel (l), shepherd (r) and TV repair man (c). After the bridge, we climbed the steep road that goes up beside the castle, which was not nearly as steep as the one that goes up directly to the castle which has steps of Exorcistic proportions. There we located, as recommended by the local paper for non-locals, a Vietnamese Buddhist restaurant. Who’d have thunk it? Inside was one of the most peaceful eating environments in the world. Soothing smells, music and half-light. It was the perfect time to renounce the meat and beer that generally constitutes the Czech diet. We had healing teas and overdosed on vegetables. It was one of the most calming, reflective and indeed healthy meals I’d had in a long time and we finished it up with some exquisite Halva. I left with an inner contentment but a serious need for a coffee. As we were in that area, we meandered over to one of the city’s many monasteries. This one still (or rather again) partially in use, but also partially converted into a gallery and library. Not to mention a restaurant and a museum of microscopic wonders, but the latter was closed alas so we sulked off into a nearby park which has a maze at its centre. After about 30 minutes of rambling, we checked the map. Lonely Planet maps often have the feel of having been drawn late at night by two stoned Australians, but it was soon clear we had missed our intended target. In fact we were now back near the castle. We decided to give up on the maze. After all, if you can’t even find a maze, the last thing you should do is go into one - you’ll never get out.